Post: Gaurav Akrani. Date: 11/27/2011. No Comments. Label: Finance. 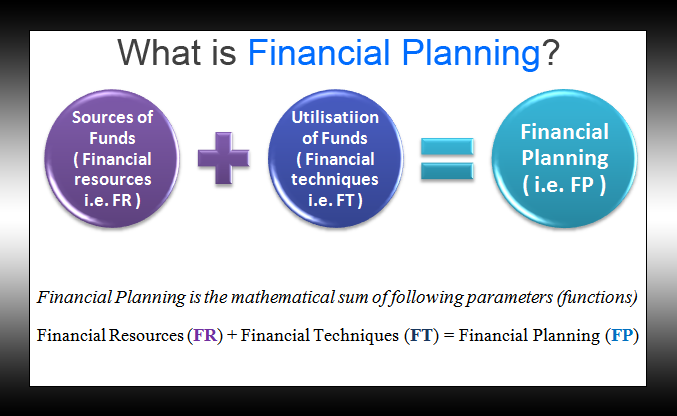 Financial planning means to prepare the financial plan. A financial plan is also called capital plan. A financial plan is an estimate of the total capital requirements of the company. It selects the most economical sources of finance. It also tells us how to use this finance profitably. Financial plan gives a total picture of the future financial activities of the company. Financial Resources (FR) + Financial Techniques (FT) = Financial Planning. How much finance (short-term, medium-term and long-term) will be required by the company? From where this finance will be acquired (gathered)? In other words, what are the sources of finance? That is, owned capital (promoter contribution, share capital) and borrowed capital (debentures, loans, overdrafts, etc.). How the company will use this acquired finance? That is, application or utilisation of funds. Financial plan is generally prepared during promotion stage. It is prepared by the Promoters (entrepreneurs) with the help of experienced (practising) professionals. The promoters must be very careful while preparing the financial plan. This is because a bad financial plan will lead to over-capitalization or under-capitalization. It is very difficult to correct a bad financial plan. Hence immense care must be taken while preparing a financial plan. After the company starts, the finance manager does the financial planning. The types of financial plans are depicted and briefly explained below. Article and image credits © Prof. Mudit Katyani. Short-term financial plan is prepared for maximum one year. This plan looks after the working capital needs of the company. 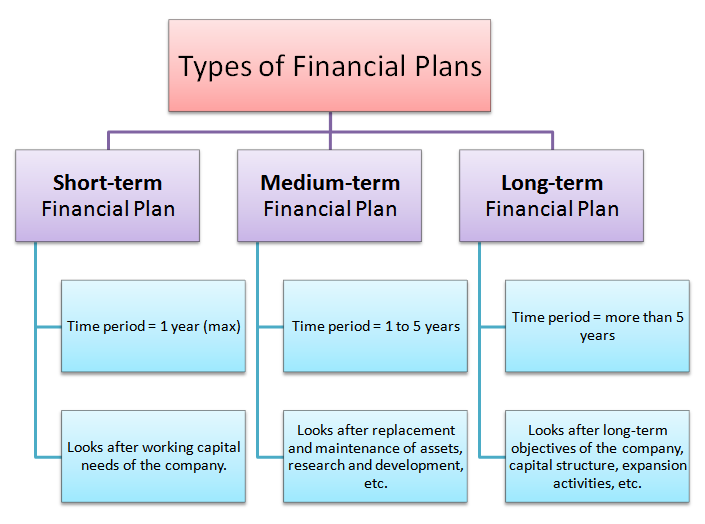 Medium-term financial plan is prepared for a period of one to five years. This plan looks after replacement and maintenance of assets, research and development, etc. Long-term financial plan is prepared for a period of more than five years. It looks after the long-term financial objectives of the company, its capital structure, expansion activities, etc.